Redemptorist Father John F. X. O’Connor, whose 20 years in the Brazilian missions left him with a lasting love of the Brazilian people, died unexpectedly of an apparent heart attack on Friday, Feb. 13, at Our Lady of Perpetual Help Rectory in Manhattan. He was 79 years old. Father O’Connor, a native of Newark, NJ, was one of two sons born to Dr. Michael and Lillian Young O’Connor. He grew up in St. Mary Parish there and, when it was time for high school, entered the Redemptorist minor seminary in North East, PA.
His first day, August 29, 1943, was a memorable one: He and other boys from the New York area headed for Pennsylvania by train. According to a classmate, Father Donald Winters, the boys managed to get themselves into the "wrong" car and the conductor decided to let them stay rather than switch with the people in the "right" car. En route, their train collided with another one and a number of passengers, including those in the "right" car, died from fire, smoke or scalding steam. The boys were unharmed. The young John O’Connor attributed their safety to the protection of Our Lady of Perpetual Help. Father Gerard Oberle also was a member of that class and recalled that he and Father O’Connor were both organists and, during summer vacations from the seminary, were able to earn stipends for playing at High Masses. Those funds helped the young O’Connor enjoy his lifelong passion for movies. Like his classmates, Father O’Connor made his novitiate year in Ilchester, MD, and his first profession of vows in 1950. He continued his studies at Mount St. Alphonsus Seminary in Esopus, making his final profession in 1953. 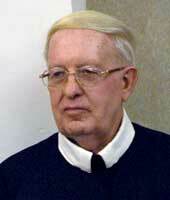 He was ordained to the priesthood on June 19, 1955. After another year of studies and a pastoral year in Annapolis, MD, Father O’Connor was assigned to the Redemptorist missions in Brazil, beginning in 1957 in Bela Vista and then in Tibagi and Monte Alegre. In 1964, he was named rector at Miranda, in the Province of Mato Grosso, and in 1970, he was assigned to Paranagua. He was appointed rector again in 1973 in Rocio and in 1975 in Ponta Grossa. "I knew him in Brazil, but we were never stationed together," said Father Francis O’Rourke. "He was very zealous with all the work and especially into youth work and all the movements, like the Cursillo." Father Clement Krug, whose family was close to the O’Connor family, recalled that his mother made the vestments for Father O’Connor’s First Mass from material of Mrs. O’Connor’s wedding gown. The two priests later were stationed together for a short time in Brazil and Father Krug said of his confrere: "He was always running around. To keep up with him, you had to have a jet engine tied to you. He was always a people person and went out to them." One type of work that particularly engaged him was vocation promotion, according to Father Gerard Schreiber. "He was a very optimistic person, which is great for vocations," he said. "I remember a group of children he had dressed in habits to represent all the religious vocations in the Church." Father Francis Sullivan, who served with Father O’Connor in Brazil, said, "He was known for his kindness and gentleness to the confreres and to the people. He was always there with a nice touch, always willing to lend a hand." He had a gift for walking in to a new place and fitting in as if he had been there for ten years, he added. That gift was a blessing when the Baltimore Provincial asked him to leave his beloved Brazil and fill the position of assistant procurator in 1977. An important part of his new job was raising money to help sustain Redemptorist missions in South America, the Caribbean, and throughout the Southern United States. "He felt he was being called to do this work and he did a lot of mission appeals, lovingly and happily," said Father Sullivan. "He was such a good man, with a certain simplicity about him." Father Raymond McCarthy, procurator at the time, recalled his confrere as "very dedicated and very reliable. He’d work at the office all day long and on the weekends he’d preach mission appeals all over…. He also did the house accounts and took care of the cemeteries." He was a welcome addition to the community at Shore Road and, later, in Manhattan, Father McCarthy said. "He was the one who’d pick up a foreign missionary at the airport no matter what time he got in," he added. Father James Small was one of those Redemptorist missionaries and remembered that when he would return to the States for a vacation (usually every three years), Father O’Connor would make sure he had parishes lined up for him to preach about the particular needs of his mission community. "He was generous, outgoing and giving," Father Small said. "I never heard him angry or criticizing anyone; he was a real gentleman." After 12 years of this work, Father O’Connor was assigned to the parish mission preaching band, first from Our Lady of Perpetual Help in Brooklyn and then, in 1992, from Our Lady of Perpetual Help (Mission Church) in Boston. The following year, he was named rector at St. John Neumann Residence in Saratoga Springs, NY. "He was one of the nicest rectors we had," said Ann Ruggieri, retired director of nursing there. "He was kind, understanding and compassionate to the confreres and the staff. . .Almost anybody who came to the house came to see him – not because he was the rector but because he was Father O’Connor. He was always looking at the good in a situation and not the bad, reminding you that things will work out." He had an infectious laugh and "you couldn’t help but laugh with him," she added. He served as rector there for two terms and then was assigned residence at Our Lady of Perpetual Help Rectory in Manhattan. Father O’Rourke was assigned there at the same time. He said of his confrere: "He’s always been the minister type, the one to notice if there were dirt on the rug or if a room needed cleaning." He also noticed and responded to any of the confreres who needed a ride to a doctor’s appointment or to see a family member or to go anywhere else. He had plans for the Saturday after he died to drive a confrere to the funeral of a sister of one of their deceased confreres, whose own funeral they had attended the previous weekend. Father John Bauer, who is stationed in Baltimore at Sacred Heart of Jesus Church, noted that his confrere "always went to funerals. He was here for my sister’s funeral last month. A good confrere all around, he came to console me." Kathy Dallessio, Father O’Connor’s "favorite niece" – not to mention his only niece, she noted – said that she and her brother Paul would look forward to their uncle’s coming home from Brazil every three years. "It seemed that anytime we did something fun, it was with Uncle John. Whatever you needed, he had it for you. . .He’d have a party for every occasion and he’d invite everybody and anyone who showed up was welcomed. That was a typical Uncle John party." One of the largest parties he arranged was for the golden jubilee of ordination of his Class of 1955. "He loved his priesthood. He loved being a Redemptorist," Father McCarthy said. "I don’t think I’ve ever met a more charitable confrere." When Father O’Connor made friends, he kept them for life. His enthusiasm for Religious life led a lot of young people to test their own vocation, Father McCarthy added. "I’d have to say, he was 100 percent charity personified." Father O’Connor is survived by his brother and sister-in-law, Joseph and Marion O’Connor; their children, Paul O’Connor and Kathy Dallessio and her husband, Tom; and a great-nephew, John, nicknamed Jack, Dallessio. There also are numerous cousins.